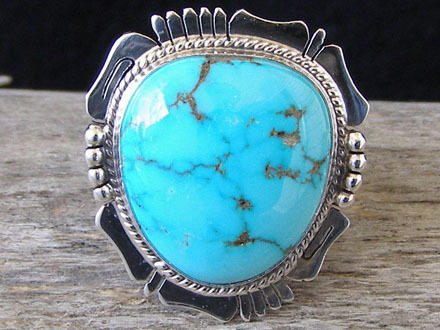 Set with a large, thick stone of natural, untreated Carico Lake turquoise cut by Bruce Mead, this ring is a combination of great silversmithing paired with a well-cut, gorgeous stone. The stone is glassy smooth and its translucent quality allows more light into the stone to enhance its soft blue glow. Ring face: 1 5/16" x 1 3/16"